Last Week in Review: Consumer and wholesale inflation remain in check, but retail sales don't add up at checkout lines. Forecast for the Week: Anticipation for housing data builds. "If you've got the money, honey, I've got the time." Lefty Frizzell. Gas prices edged higher recently, but consumers aren't necessarily feeling a pinch because overall inflation remains tame. While retail prices are trying to woo shoppers, receipts aren't racking up. Despite oil hitting its 2016 high in the U.S., wholesale and consumer inflation remain tame. The March Producer Price Index (PPI) and Core PPI, which strips out volatile food and energy, both fell 0.1 percent. On the consumer side, price increases did not reach expectations, with the Consumer Price Index (CPI) and Core CPI only rising 0.1 percent. The cost for housing, medical care and cigarettes edged higher, but these were offset by lower costs for clothing, furniture and used cars. On an annual basis, CPI and Core CPI also were below expected increases. While price tags remain in check, consumers spent less than expected last month at department stores, clothing outlets and restaurants, further cementing the notion that economic growth slipped in the first three months of 2016. 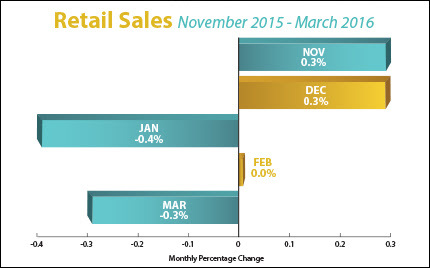 March Retail Sales fell 0.3 percent versus the 0.1 percent expected. Stripping out autos, sales were up 0.2 percent, only half of what was expected. Plus, March saw the biggest decline in demand for autos in a year. On the home loan front, rates remain just above historic lows at levels not seen in nearly 3 years! According to the latest data released Thursday by Freddie Mac, the 30-year fixed-rate average slipped to 3.58 percent with an average 0.5 point, its lowest level since May 2013. (Points are fees paid to a lender equal to 1 percent of the loan amount.) It was 3.59 percent a week ago and 3.67 percent a year ago. The 30-year fixed-rate has dropped 43 basis points since the start of the year. If you or someone you know has any questions about current rates or home loan products, please don't hesitate to email or call me. Housing data takes center stage this week. Builder sentiment is shared in Monday's National Association of Home Builders Housing Market Index. Tuesday brings Building Permits and Housing Starts from March. March Existing Home Sales will be shared Wednesday. On Thursday, look for weekly Initial Jobless Claims as well as manufacturing news from the Philadelphia Fed Index. And get the most popular real estate stories you need to read delivered straight to your inbox - for FREE!